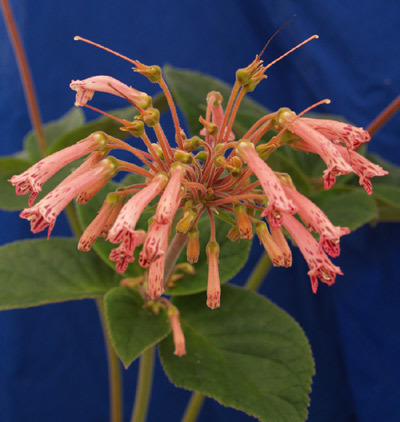 This hybrid was created by Jon Lindstrom, professor of horticulture at the University of Arkansas, and his graduate student Bruce Dunn. They grew and photographed the plants. This is another demonstration that S. piresiana is a good parent for crosses, because the hybrid inherits the markings on the outside of the corolla tube. 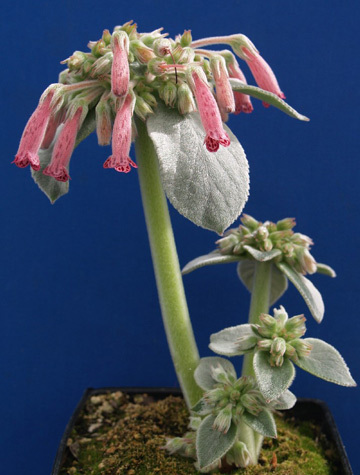 It is also noteworthy that the flowers have external silvery hairs. (See the flower picture below.) 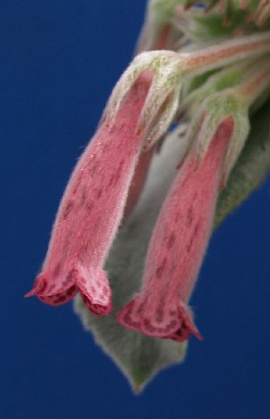 Not all forms of Sinningia leucotricha have hairy flowers; perhaps Jon's was similar to what Jon Dixon calls the "Max Dekking" form. The foliage on this cross suggests that crossing two hairy species is a good idea. Here both S. leucotricha and S. piresiana contribute hairiness to the hybrid. Silver hairs x ordinary hairs results in less impressive foliage (see S. leucotricha x cardinalis). Here we can see the corolla streaks from the S. piresiana parent. They are somewhat hidden by the silver hairs. The markings on the corolla lobes are not obscured by hairs and are very dramatic. Dormancy Since both parents have obligate dormancy, one would expect it of the hybrid too. Inflorescence terminal cluster like both parents. Flower Hairy, tubular. Color appears similar to that of S. piresiana. Like the above cross, this hybrid was also created by Jon Lindstrom and Bruce Dunn. Comparing the two is instructive. The foliage of S. insularis x piresiana looks much like that of S. insularis: no silvery hairs in evidence (from the photo, anyway). The foliage of S. piresiana x leucotricha has the same sort of silvery hairs as S. leucotricha. Both hybrids have piresiana-type streaks on the outside of the corolla. Both hybrids have piresiana-type markings on the corolla lobes. From this we can hypothesize that piresiana's corolla marking patterns are dominant, that the indeterminate habit is dominant in sinningias, and that the presence of silvery hairs on sinningia leaves has a more complicated inheritance system than just dominance (yes/no) or addition (both parents contribute).